Milos Raonic of Thornhill, Ont., powered past Ruben Ramirez Hidalgo of Spain 6-4, 6-2, 6-2 to reach the second round of the French Open on Monday. 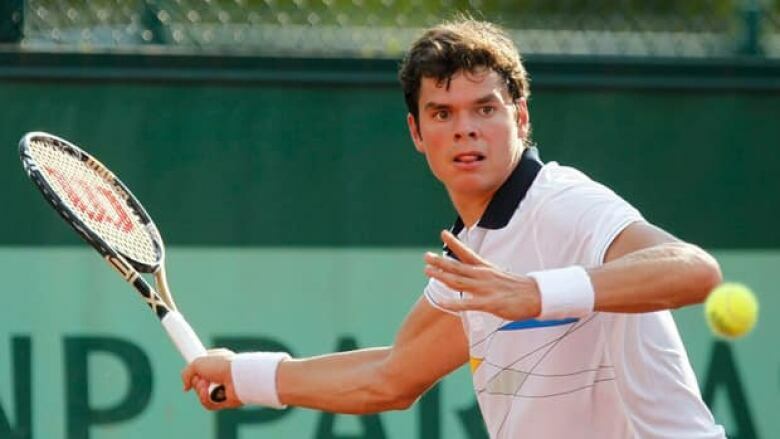 Canadian Milos Raonic has already improved on last year's performance at the French Open. Raonic powered past Ruben Ramirez Hidalgo of Spain 6-4, 6-2, 6-2, on Monday to reach the second round of the tournament. The 19th-seed from Thornhill, Ont., opened with a win on another sunny day at Roland Garros after losing in the first round a year ago to German Michael Berrer. "It was good to finally win my first match here," said Raonic. "It was good to play a guy like him, who doesn't give you much. I had to go and win the match." Raonic will next face American qualifier Jesse Levine, who beat Benjamin Becker of Germany 7-5, 6-2, 6-4. "I need to keep doing the right things and I need to work on my serving a bit," said Raonic. "I'll have to go out and play aggressive against him." The Canadian dominated from the start, breaking his Spanish opponent five times with 12 aces. Raonic ended with 58 winners against just 10 for Ramirez Hidalgo. "I put pressure on him and was able to depend on my serve," said Raonic, ranked 22nd on the ATP. "I feel in control as long as I can dictate. I get nervous before all of my matches and I didn't know what to expect from him. "Once I got into my game I relaxed and was able to play within myself." Earlier, fellow Canadian Frank Dancevic exited the tournament after less than 30 minutes on the court, retiring due to a back issue. The Niagara Falls, Ont., native was down 4-0 to Martin Klizan of Slovakia when he pulled out of the first-round match. Dancevic said he was afraid to risk aggravating a back injury he suffered last month in Florida. "I was petrified out there, I didn't know what would happen. I started feeling twinges even during the warm-up and it only got worse during the match," said Dancevic. "I didn't want to mess up my whole summer, it was just not worth it for me." The 28-year-old took treatment after the third game but knew he could not go on. "I wasn't able to play at 100 per cent, I was not in it at all," he said. "I played careful, I was scared to go for anything, I just knew there was no way I could go on." The Canadian is hoping to continue healing and could be a long shot entry into Wimbledon. If not, then he will plan to be ready for the Newport grass event in the U.S. which begins July 9. "I've entered Wimbledon qualifying just in case I'm feeling really great," he said. "I was playing so well in the spring and then I got this injury, for five days I lay on the floor with my legs on a bed, I was immobile. I only started training last week. "But I'm still hoping to come back and play well," said the 120th-ranked Dancevic. "I would like to crack the top 100."